After the initial rush for homes following the Tubbs Fire in October 2017, North Bay home sales activity slowed more than in the rest of the Bay Area, particularly in Sonoma County. Sales of residential lots in Sonoma County have jumped by 265 percent year to date from 138 parcels sold in 2017 to 504 this year. Sonoma County’s inventory levels rose faster than in the rest of Bay Area following the fires. While annual median home price growth in Sonoma County was up by more than 15 percent following the fires, it started slowing shortly after — much sooner than the rest of the Bay Area. However, median home prices in the 95403 and 95404 ZIP codes remained relativity steady, averaging 8 percent year-over-year growth from January through October. According to Compass Bay Area transaction data, 15 percent of all buyers after the disaster purchased a home because they lost their previous one in the wildfires, with the median purchase price at $625,000. To find a home, buyers increasingly relied on their friends and family, with about one in 10 finding a property through personal connections, up from only 1 percent prior to the fires. Eleven percent of sellers over the last year sold because they lost their homes in the fires. Wine Country sellers do seem to be aggressively moving out of state; before the fires, only 2 percent of sellers liquidated because they were leaving California. Post-disaster, out-migrants ticked up to 11 percent of all sellers. Wildfires are a harsh reality of living in California, especially during the month of October. Thousands of fires burn throughout the state at all times every year, but October seems to be the worst month. Six of California’s seven most destructive wildfires happened in October, including the Tubbs Fire in Sonoma and Napa counties, which was previously ranked as the most devastating California wildfire, claiming more than 5,600 structures and 22 lives. Unfortunately, the more recent Camp Fire in Butte County was significantly more catastrophic, taking more than 18,000 structures and 88 lives and now ranking as the state’s worst wildfire. In addition, the Woolsey Fire in Los Angeles and Ventura counties, which started on the same day as the Camp Fire (Nov. 8) destroyed more than 1,500 structures and claimed three lives. The following analysis examines North Bay housing markets a year after the Tubbs Fire, which ignited on Oct. 8, 2017, compared with market activity before the tragedy. Comparing total home sales in the first 10 months of 2018 with the same period in 2017 suggests that overall activity has declined in Sonoma, Napa, and Marin counties — but not notably more than in the rest of the Bay Area. Figure 1 summarizes year-to-date (January through September) sales in North Bay counties and the overall Bay Area. (October sales are omitted because the fires started early that month in 2017.) All areas saw fewer sales than in 2017, with the rest of the Bay Area tracking 4 percent below last year. Sales in Marin County were down by 3 percent, with Napa and Sonoma counties recording respective declines of 5 percent and 7 percent. Nevertheless, while overall sales trended lower due to fewer transactions below $1 million, North Bay counties saw stronger activity for higher-priced homes — similar to the rest of the Bay Area — with Sonoma and Napa counties both posting increases of more than 20 percent in sales of homes priced above $1 million. 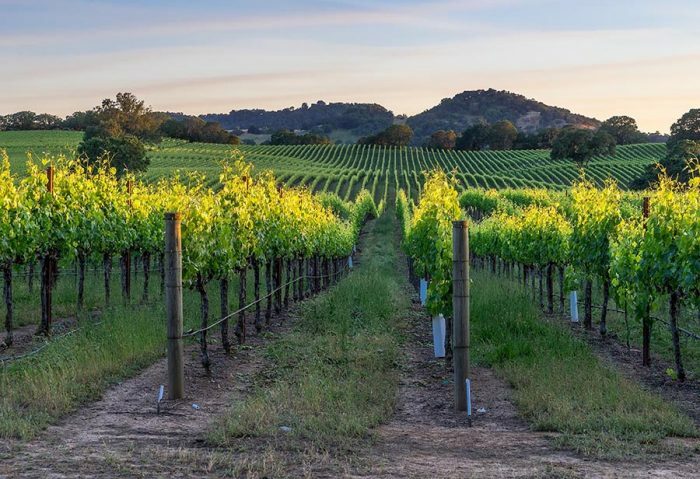 In Sonoma County, sales above $1 million have contributed 17 percent to overall 2018 activity, up from 13 percent in 2017. In Napa County, higher-priced sales accounted for 25 percent of overall 2018 sales compared with 20 percent in 2017. Higher-priced home sales in Marin County now contribute 61 percent of activity, up from 54 percent last year, and have seen a relatively smaller increase, though 2017 was a very strong year for higher-priced sales there. Nevertheless, while total year-to-date sales activity in the North Bay lines up closely with the rest of the Bay Area, the region followed a slightly different trend immediately following the fires. Figure 2 illustrates year-over-year changes in sales from October 2017 to September 2018. In the North Bay, October 2017 sales posted an 11 percent decline, as the fires raged through the area that month, before jumping to a 15 percent increase immediately after the disaster and remaining elevated until February. Starting in March, North Bay sales activity returned to follow overall Bay Area trends but still tracked lower than the overall region. Between March and September, North Bay monthly home sales declines averaged about 6 percentage points lower than the Bay Area. For example, in June, while North Bay sales dropped by 15 percent on an annual basis, Bay Area sales declined by 9 percent. In August, the North Bay again outperformed the Bay Area, with a 2 percent decline versus a 9 percent decrease in the entire region. In September, the whole Bay Area posted a 20 percent drop in sales activity. Figure 3 breaks out home sales numbers for the three North Bay counties. While Napa County shows more volatility in monthly changes, activity is consistent with long-term trends, possibly due to relatively fewer monthly sales. Napa County averages slightly more than 100 sales a month. By contrast, it is interesting to note a 29 percent jump in November sales in Marin County, as families who lost their homes in fire-affected areas started shopping. After January, Marin County sales returned to follow Bay Area trends. 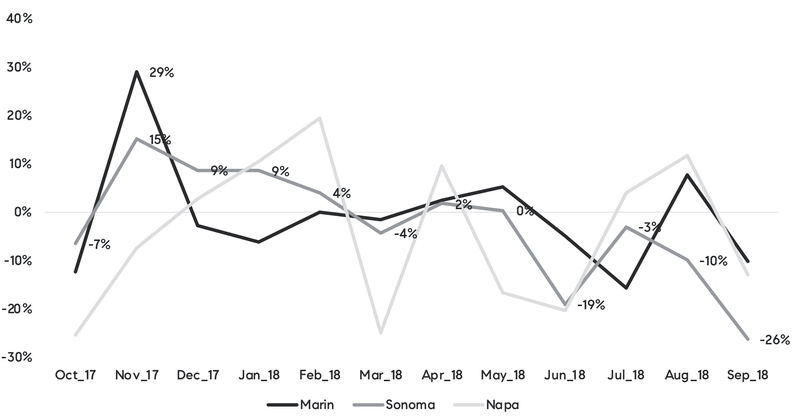 The decrease in Sonoma County sales after the initial jump in early 2018 continued throughout summer, even while Napa and Marin counties saw improvement. In September, however, Sonoma County posed the largest year-over-year decline of all Bay Area counties, at 26 percent. Figure 3: Year-over-year change in home sales by North Bay county. Nevertheless, while sales of single-family homes have declined overall in Sonoma County, there has been a substantial increase in sales of residential lots, which skyrocketed by 265 percent in the first three quarters compared with the same period last year, from 138 parcels to 504. Seventy-seven percent, or 389, of the lots sold were parcels where homes were destroyed by the fires. 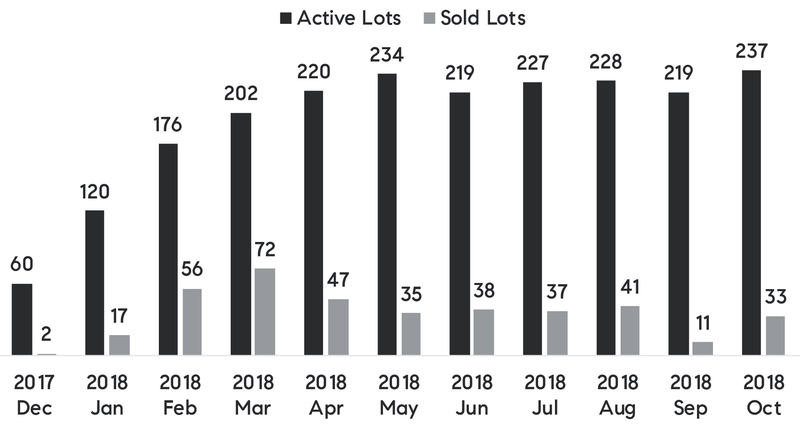 Figure 4 summarizes the sales activity of fire-affected lots over the last year and illustrates the number of such parcels for sale in Sonoma County. Similar to sales of existing homes, fire-lot sales peaked in March and have since leveled off. Importantly, almost all of the 389 fire lots sold were in two ZIP codes: 95403 and 95404, two adjacent urbanized areas in Santa Rosa. The impact of the wildfires in those two areas is discussed below. The number of lots available for sale has remained consistently elevated since the fires. Let’s turn to the impact on inventory of existing homes. Supply shortages of single-family homes and condominiums, which characterized most of 2017, persisted through the first half of 2018 before improving. 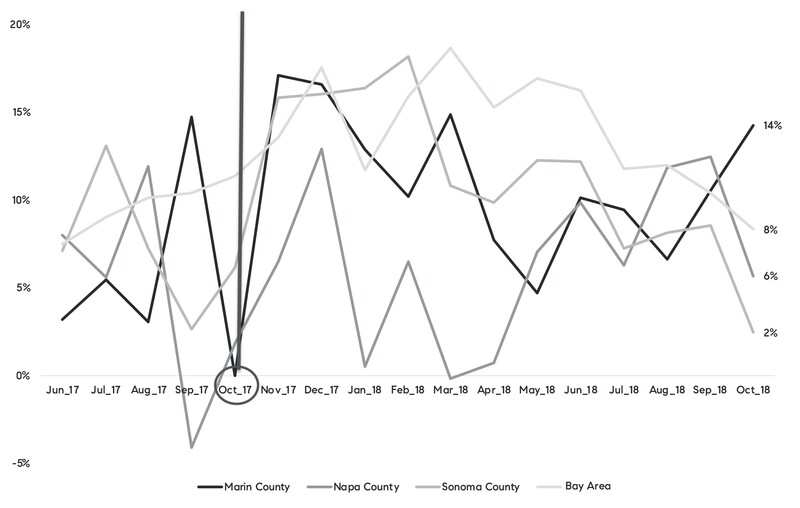 Figure 5 illustrates inventory trends in the North Bay compared with the rest of the Bay Area, and the line demarcates October 2017, the onset of the wildfires. Immediately following the fires, inventory continued its downward trend, though the Bay Area lost supply at a faster pace than North Bay counties. Starting in the late spring, increases in supply finally began to match last year’s levels. 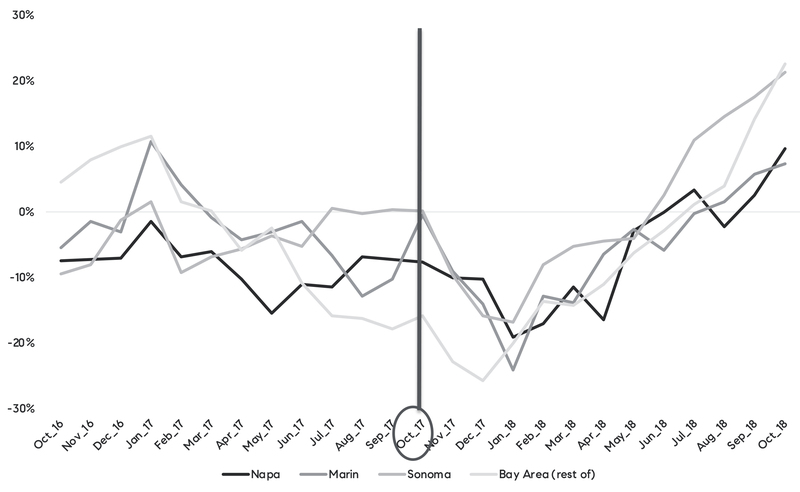 Most interestingly, Sonoma County’s inventory improved before the rest of the region in the early spring, climbing to an 18 percent year-over-year increase in September. Inventory in the rest of the Bay Area caught up with Sonoma County after the summer and posted a 14 percent annual gain in September. Napa and Marin counties (along with San Francisco, not shown here) showed the smallest annual increase in inventory in the Bay Area in September, with Marin up by 6 percent, and Napa County logging a 2 percent gain. In October, however, all regions posted even higher increases in inventory, and the Bay Area’s 23 percent gain outpaced Sonoma County’s 21 percent improvement. 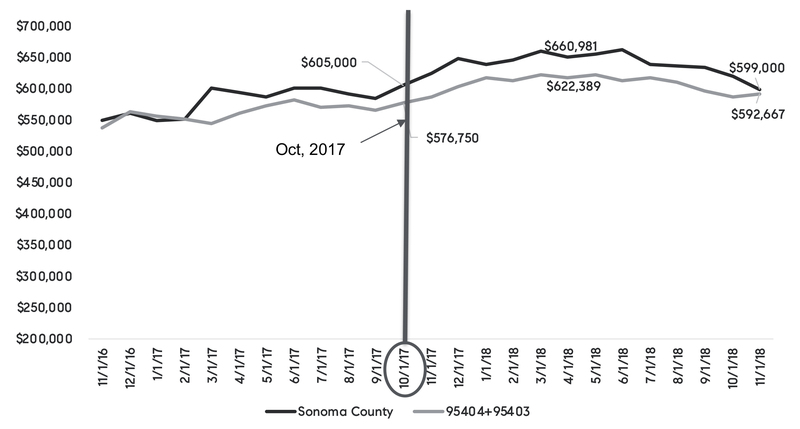 The recent increase in inventory in Sonoma County is mostly driven by the availability of homes priced below $1 million, while higher-priced homes still trend below last year’s levels. Sonoma County is not the only area where more affordable homes are making a comeback; it is a trend seen across the region, with the most significant increases in Santa Clara and Napa counties, along with the East Bay. Only San Mateo, Marin, and San Francisco counties continue to see no or very small improvements in affordable inventory. But while Sonoma and Napa counties are not experiencing increases in higher-priced inventory, other local regions are. Considering supply changes across regions, it is hard to determine a notable difference between the Wine Country and other Bay Area counties. However, the overall increase in inventory suggests that sellers may believe that home price appreciation has peaked and that it may be a good time to list their properties. In addition, the uptick in lower-priced inventory indicates that affordability burdens coupled with traffic congestion and the Bay Area’s overall cost of living may be taking a toll on budget-constrained households — especially in Sonoma County, where access to employment centers is limited due to fewer transportation corridors. Moreover, in addition to more residential units available for sale, the number of lots on the market has increased notably. 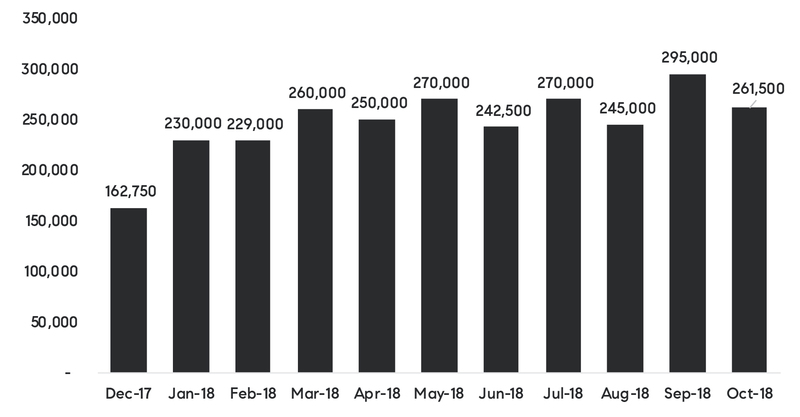 As shown in Figure 4, there has been a significant gain in number of available parcels each month since December, and while the absorption rate declined from the initial rush, it is still consistent with longer-term trends seen in Sonoma County. Again, keep in mind that almost all of the fire-lot activity is centered in the 95404 and 95403 ZIP codes. In terms of median home prices in the Wine Country and the Bay Area following the wildfires, Figure 6 illustrates year-over-year changes since August 2017. Unlike in the overall Bay Area, the North Bay began seeing slower price growth in September 2017 prior to the fires. Following the events, Sonoma and Napa counties saw a large jump in price growth — about 15 percent to 18 percent in the first few months of 2018 — but appreciation then started falling much before it did in the overall Bay Area. In October, Sonoma County registered only a 2 percent price increase from last October, while Napa and Marin counties (and the rest of the Bay Area) maintained 10 percent median price growth. Figure 7 tracks median home prices in Sonoma County and the two ZIP codes most affected by the wildfires. While Sonoma County’s overall median sales price growth averaged 11 percent in the last year, appreciation averaged 8 percent in the 95403 and 95404 neighborhoods. In November, however, Sonoma County’s median price posted a 4 percent year-over-year decline, with the two aforementioned ZIP codes seeing no change from last year. In other words, urbanized ZIP codes that were most impacted by the fires did not lose appeal with homebuyers. In addition, the price of lots increased from over $162,000 in December 2017 to hover around $260,000 in the last few months, with no significant declines recently. Figure 8 illustrates changes in the median price of lots sold. However, rapid price growth following the fires, along with higher interest rates, took a large bite out of affordability, which is the main reason for slowing sales and prices in Sonoma County and the Bay Area in general. Taking together year-to-date price growth of 9 percent in Sonoma County and about a 100-basis-point increase in mortgage rates, the added cost to local homebuyers is more than 13 percent. The weight of the affordability crisis in Sonoma County is further evident by the large increase in price reductions for homes priced below $1 million. Sales with a reduction jumped from 26 percent last September and October to 45 percent one year later. The only other areas with similar increases in price drops for homes priced below $1 million are the South Peninsula and Santa Clara County, though the price difference when compared with Sonoma County is notably larger, even for affordable homes. For example, while the overall median sales price in Sonoma County hovers around $600,000, the median price of homes below $1 million is still 40 percent higher — $845,000 — in the South Bay. In addition, other indicators such as time on market and absorption rates suggest that buyers of affordable homes have taken a large step back in Sonoma County, though much less so in Marin and Napa counties. Lastly, an analysis of Compass’ California Bay Area buyer and seller data reveals compelling insights. First, 15 percent of all buyers after the wildfires purchased a home because they lost property in the disaster, with a median price of $625,000. Also, 50 percent of buyers who bought because they lost their homes noted location as essential — suggesting that they were sticking around because of jobs, family, and schools. Furthermore, investor activity increased following the fires. Prior to the October 2017 events, only 1 percent of buyers bought to develop and flip a property; that share jumped to 8 percent afterward. To find a home, buyers increasingly relied on friends and family, with almost one in 10 locating a property via personal connections, up from 1 percent prior to the fires. Additionally, 11 percent of sellers over the last year liquidated property because they lost their home in the fires. More Wine Country sellers seem to be moving out of state; before the fires, only 2 percent of local homeowners sold because they were moving out of California. After the fires, move-outs jumped to 11 percent of all sellers. In summary, as major previous California wildfires have shown — such as the Oakland Hills Fire in 1991 and the Cedar Fire in San Diego in 2003 — communities generally return to their pre-disaster conditions within a year or two following the incidents and market activity lines up with longer-term trends in those respective counties. However, the impact of Camp Fire may be felt much longer in Butte County and surrounding areas as a larger share of housing stock was lost. Also, the lack of new construction due to labor, cleared land, and lumber shortages that has crippled the industry over the last few years shows no signs of improvement. Nevertheless, while the reality of wildfires in California remains, the bigger question facing both homeowners and renters is the overall quality of life. With expensive housing and increased commute times, budget-constrained households may choose to relocate, and these trends are not only seen in Sonoma County but also in California’s most expensive housing markets in the heart of Silicon Valley.